There are two main methods of advertising routes into BGP – network statements and redistribution. r  3.3.3.3/32       2.2.2.2                                0 23 ? r>                  3.3.3.3                  0             0 23 ? r  10.0.13.0/29     2.2.2.2                                0 23 ? *  10.0.23.0/29     2.2.2.2                                0 23 ? *>                  3.3.3.3                  0             0 23 ? *  192.168.3.0      2.2.2.2                                0 23 ? This is because R1 already has a static route to 3.3.3.3/32 and is directly connected to 10.0.13.0/29. As well being less clumsy, this is much more like a real-world scenario where an ISP would be filtering the routes it advertises to a customer or vice versa. I hope this has been a useful explanation. 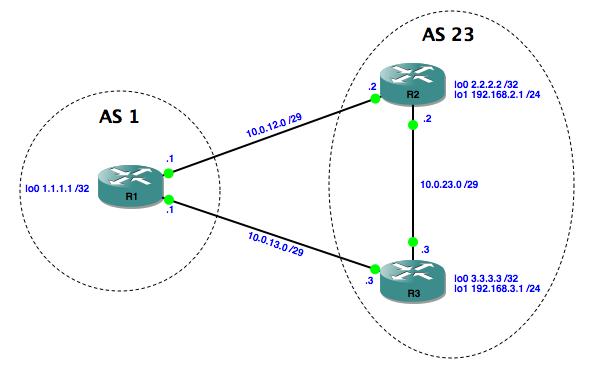 The next post in this series looks at modifying BGP attributes to inlfuence route selection. little confused. Aren’t R2 and R3 are iBGP peers as they are on same AS? on configuration , you used ebgp-multihop. Hello Abbass, I believe that it is just for illustrative purposes that Rich had chosen to use loop-backs for all bgp neighbor-ship, that’s the reason for using ebgp-multihop. However, ebgp-multhop is only used for external-bgp connectivity, where there is no direct physical connection between two ebgp neighbors.